Even better, my elevenses of a croissant, apple and a Coke come to less than €10 euros… and that is at a restaurant halfway up the slopes! On top of that you are just over an hour from the beaches of Almunecar and half an hour to the celebrated Alhambra. That is hard to beat. 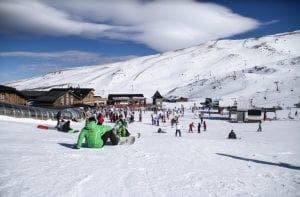 New kilometres of pistes are added every year and this year – by amazing fortune – it snowed so heavily in November, the resort opened a week earlier than expected, with a record 40,000 skiers enjoying the December 6 bank holiday ‘puente’ weekend. There were 50km of runs open by mid December – while much of Europe was mostly still ‘brown’ – and by the time the season really kicks in there will be over 100kms of pistes open for all the family. This includes the celebrated Laguna valley, for expert skiers, as well as the excellent Superpark Sulayr, Europe’s largest freestyle snowboard park. This includes the fabulous 165 metre long ‘half pipe’, amazing for snowboarders. And then there is the famous ‘Rio’ run that leads right down to the resort of Pradollano, which sits at 2,100 metres. At the same latitude as Cyprus and just 30 miles from the beaches of the Costa del Sol, it is nothing short of amazing really that you can ski here through to May. Named after a 15th century Arabic king Muley Hacen (Abdul Hassan Ali), who is said to have been buried at the top, this is the highest peak in mainland Spain. 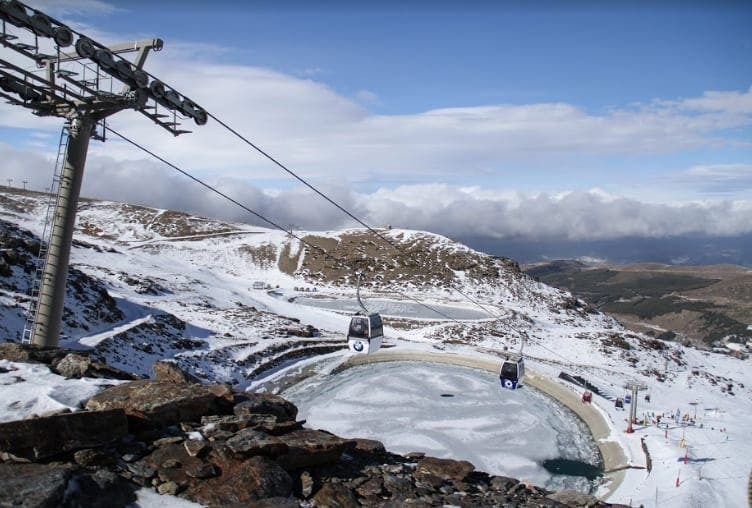 From here, competent skiers are spoilt with the amazing runs of the Laguna de las Yeguas area, including the celebrated Olympic run, which is full of twists and turns. Here, you can sometimes find yourself skiing alone midweek for up to ten minutes and the sheer nature and landscape are spectacular. It is incredibly easy to have a day or two’s skiing in Europe’s most southerly skiing resort. Just two hours from the Costa del Sol, you head up to the resort of Pradollano, 20 minutes above Granada, where you can park easily in the underground car park right below the main square. Staying longer – or on a budget – take the turning left, marked ‘albergues’ just before you arrive and head uphill through a pine forest, before taking a right towards the resort. Drive down a long windy road through the resort, keeping your eyes peeled for a free space, but beware ‘gruas’ are out in force and you will be towed away if you park badly. From here, you are a five or ten minute walk down to the centre of the resort, where you will find dozens of places to rent skis and buy your ‘forfait’ (or ski pass) from a machine using your credit card. It is not cheap at between €37 and €48 for a day’s skiing, but you can get a half day for €36 kicking off at 1pm and children get decent discounts, while those in their 70s get free passes. While a modern resort, Pradollano itself is a pleasant place to simply take in the air or a spot of lunch, and there is a fair amount for children to do, with entertainers and Disney figures wandering around, particularly around Christmas. “Since then the infrastructure changes were huge and it is now a big resort,” explains resort marketing boss Santiago Sevilla, who has worked there for over a decade. Giles Birch, who runs the British Ski Center, estimates that Pradollano has one of the longest seasons in Europe, opening at the start of December and often going through to mid May. And then there is the famous adage that it is easy to have a morning’s snow ploughing in the Sierra Nevada followed by an afternoon on the beach. A few years ago local Granada newspaper Ideal decided to try it out the theory, picking a sunny day in May and a couple of foreign students based in Granada. “It worked perfectly and by 3pm they were settled in eating a paella on the beach,” explains Sevilla, whose company Cetursa has run the resort for decades. “Then by 9pm, not content to call it a day, they were having a tapas crawl around the Albaicin of Granada just to add the icing on the cake,” he adds. There is much more to the Sierra Nevada than sliding down it on two planks of wood. You can tackle it by toboggan and snowboard, or on a snowshoe hike (akin to walking with a tennis racket strapped to each foot). And if that sounds like too much action, you can always swap icy snow for a hot steam bath and indulge in some me-time at one of several hotel spas. All year round, the Sierra Nevada is paradise for fresh air fiends. After ‘the melt’, the resort becomes a paradise for walkers, wildlife lovers and mountain bikers. Get the best views by taking advantage of the ski lifts, which in summer carry both people and bikes to the summit to enjoy breathtaking routes back down. Borreguiles, the resort’s impressive ski bowl, boasts a bike park in the hotter months. Youngsters can test their strengths in the mini-olympiads zone or race against each other on the pedal car track. Guided dawn and dusk walks and a bumper running and cycling race calendar are a magnet keeping the resort busy 12 months of the year. Previous articleHow did far-right party Vox do so well in Andalucia election…and what could it mean for Spain?